Simon Armitage presents the extraordinary story of the most disturbing witch trial in British history and the key role played in it by one nine-year-old girl. Jennet Device, a beggar-girl from Pendle in Lancashire, was the star witness in the trial in 1612 of her own mother, brother, sister and many of her neighbours and, thanks to her chilling testimony, they were all hanged. 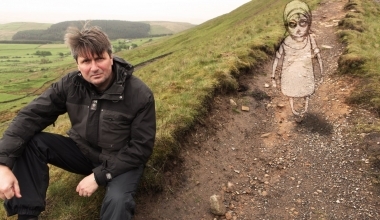 In "The Pendle Witch Child" poet Armitage explores the lethal power and influence of one child's words - a story of fear, magic and demonic pacts retold partly with vivid and innovative hand-drawn animation. He discovers how Jennet's appearance in the witness box cast its shadow way beyond Lancashire, impressing lawyers, politicians, clerics and even the King himself. Finally, in a dramatic twist to the tale, he reveals how, 22 years after the original trial, accused of being a witch by a 10-year-old boy. With the help of historians Malcolm Gaskill, Diane Purkiss and Ronald Hutton, Simon Armitage attempts to get inside Jennet's head and understand how the illegitimate and illiterate youngest child of a family of beggars could become both pawn and player in a much bigger story of 17th century religion, power, law, science and the monarchy.